A simple Venn Diagram that compares the myth, "The Odyssey," to the movie, "O' Brother Where Art Thou?" The comparison is based on the elements of a hero myth. When they are done, have them write the essay that I have for sale here on my site. This is a great closing activity that your class will enjoy. It follows along with Homer's great epic "The Odyssey" and focuses on the important information. Your students will enjoy this activity and you will boost their confidence by allowing them to thrive! This is an assignment sheet for students who read Homer's Odyssey and then watch the 2000 Coen Brothers film O Brother, Where Art Thou? This essay asks students to create criteria for what makes an effective adaptation of a film and explain whether O Brother is effective in a five-paragraph essay. 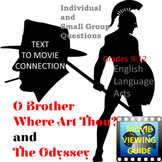 After reading the Odyssey and while viewing O Brother, Where Art Thou?, students can use this graphic organizer to make comparisons between the epic poem and this film. The updated version of this file includes an answer key. "The Odyssey" and O Brother Where Art Thou? Comparing the Mediums! Also included in: Comparing Mediums BUNDLE! "Hamlet" "The Odyssey" "Julius Caesar" and "Macbeth!" After reading Homer's The Odyssey and viewing the Coen Brothers' film O Brother, Where Art Thou? have students write a multi-paragraph essay drawing parallels from the epic and the film. In Microsoft word, so you can personalize. After reading, analyzing, and writing about The Odyssey, this worksheet will help students compare the events of the epic to those of 'O Brother Where Art Thou?' as part of the unit "The Odyssey: Epic Mythology and the Personal Journey". 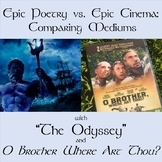 The following is a four column table comparing the book of "The Odyssey" to the movie of "O Brother, Where Art Thou?" Students are asked to describe how they are alike and different. A graphic organizer to help students make a point by point comparison between The Odyssey Film and O Brother Where Art Thou followed by a summative writing assignment. 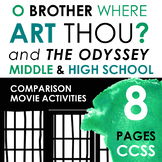 Odyssey - Comparison Chart and Essay with O Brother, Where Art Thou? This viewing guide for O Brother! Where Art Thou? contains many questions to keep students interested in the film. It also compares the movie to Homer's Odyssey and requires students to see the similarities between the two works. 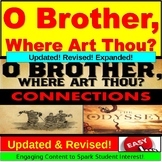 O Brother Where Art Thou movie worksheet is designed to use as the students watch the movie. It keeps them focused as they view this spoof on Homer's Odyssey as if it we taking place during the Great Depression. Fun assignment which lends itself to further study of the depression. The directions to this simple movie guide read like this: As you watch O Brother, Where Art Thou? complete the following guide by comparing and contrasting Ulysses Everett McGill's journey to that of Odysseus’ in The Odyssey. Movie guide for O Brother, Where Art Thou? with questions relating to The Odyssey. Answer Key included. 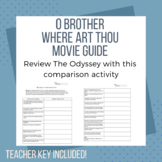 A comparison activity that connects Homer's The Odyssey with the film O Brother, Where Art Thou?